Drafting/Architect Circles – Know Your Field Of View! That all sounds profound I guess, but you’ve got a book open and are trying to keep track of a flashlight while keeping your arm still as you bounce your head back-and-forth in this really dense part of sky because you don’t know if you’re looking at M36, M37, or M38 in Auriga and you know you’ll NEVER find that part of the sky again. The, if you’ll pardon the expression, dark art of star-hoping is one that absolutely requires practice. More importantly, it requires having a proper frame of reference. 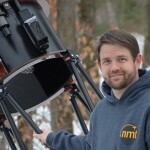 I admit that I spent more than a few months with my trusty Nikon Action 12×50′s without ever actually having a handle on just how big the piece of celestial real estate I was staring at was. 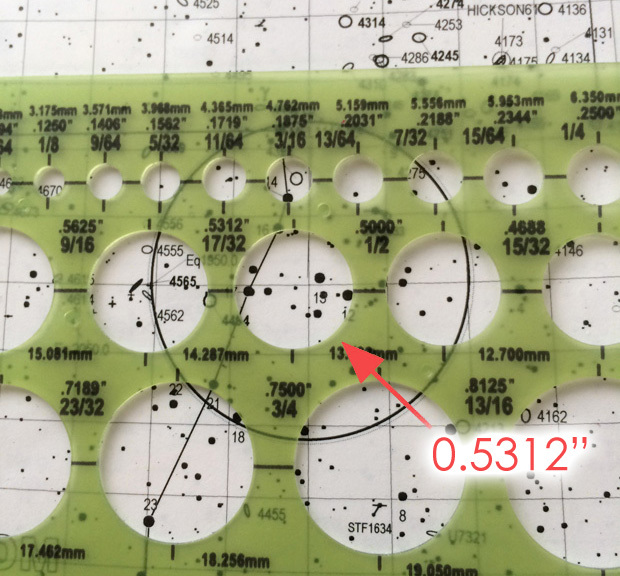 My solution, and one that is generally applicable to all your binoculars (and low-magnification eyepieces in your scope), was to buy an architect or drafting circle set. Yes, one of the green numbers with all the holes. 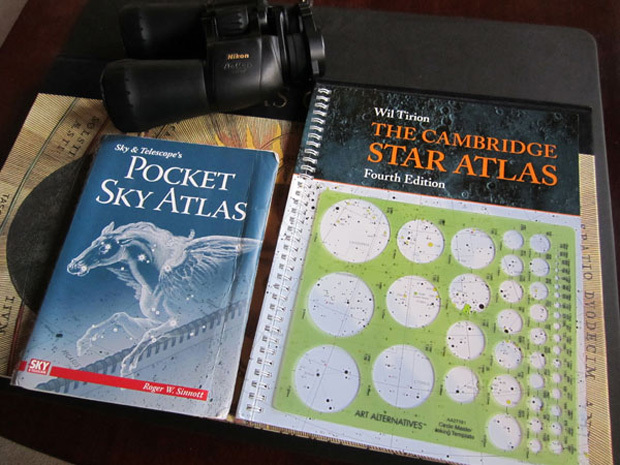 If you have one book you’ve committed to (in my case, Sky And Telescope’s Pocket Sky Atlas, but I also have a copy of the Cambridge Star Atlas that hasn’t had its spine properly cracked yet), find some obvious star groupings, see how many of them you can get in your field of view, crack your book open to the right page, and overlay until your circle engulfs only what you see. For the Cambridge Atlas, this same piece of sky encompasses a 0.8125″ circle. Depending on how much celestial real estate your star atlas covers per page, you can even take it one step farther. 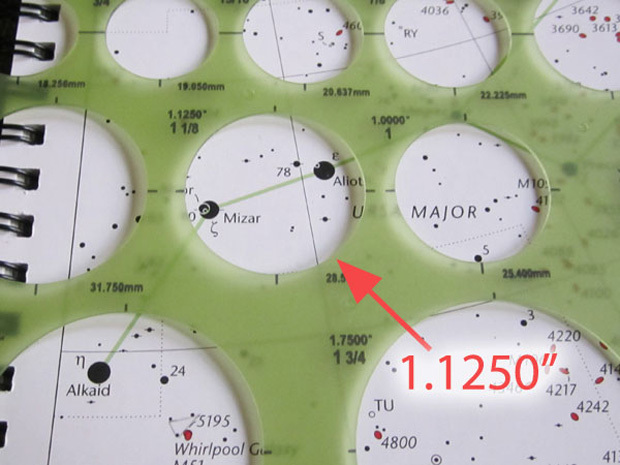 I have recently begun carrying around Version B of the awesome TriAtlas, which is a free 107-page star chart with stars down to magnitude 11.6. This means lots of stars, but also a full 8.5″ x 11″ piece of paper for each of 107 pieces of the entire sky. 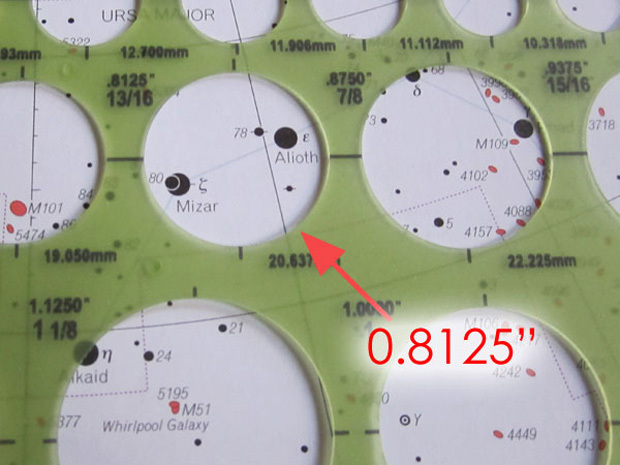 In working through Coma Berenices to find my favorite galaxy (NGC 4565), I found that the effective magnification of the B TriAtlas charts are such that my 40 mm Pentax XL 40 (which, in my 12.5″ f/4.87 Dob, corresponds to a magnification of just under 40x) shows a piece of sky that corresponds to a 17/32″ (or 0.5312″) circle. This now becomes my finder circle for knowing what I should see through this eyepiece (inverted in the Dobsonian, of course). With some object found by a 40x search, I can then step up the magnification with my 26 mm Nagler and 10 mm Ethos. As ever, the value of a very low-power eyepiece cannot be overstated! For those wanting to try this at home and don’t want to wait for shipping, drafting circles are available at Staples and Office Max in their “drafting” section. Those in Syracuse can also find them at Commercial Art Supply (where I get ALL of my red acetate).